Being a stay-at-home mum makes my home pretty much my life. I sleep here. I play (a lot!) here. I work here. I eat here. Sure I get to take short trips for nursery drop offs, the zoo and to meet up with other people. Very occasionally, I get an evening away. But my home is where I’m at. Sometimes I fantasise about an office just for a change of scenery (even though I’m well aware of the visual monotony sitting at a desk all day can bring). The only way forward seems to try to carve out a space in my home where I can work. A place that when I sit there, I have permission to follow through a thought process from start to finish. 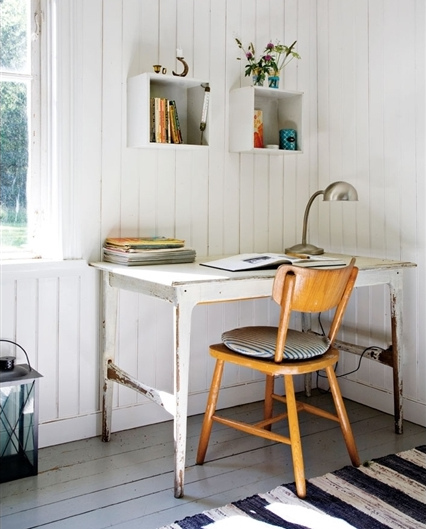 This beautifully simple workspace, from an old, Swedish cottage, ticks all the boxes for me. Although, I’d be tempted to switch in a small, leather armchair for added comfort.